Robart Pinchless Bits are designed by American horse trainer, Dave Robart. Through training hundreds of problem horses and counseling as many owners and trainers, the "Pinchless Bit" was developed. Robart Pinchless bits are used by conscientious horse owners and Olympians alike. Problems like head tossing, mouth gaping, heavy on forehand and many others have been positively affected by use of a pinchless bit. Each bit has a patented internal bushing, allowing either side of the bit to move independently from the other. Made of stainless steel the bit is lightweight. It has a solid jointed mouth and flat rings. Each side of the mouthpiece can be rotated independently. This bit puts pressure on the tongue, bars, lips. 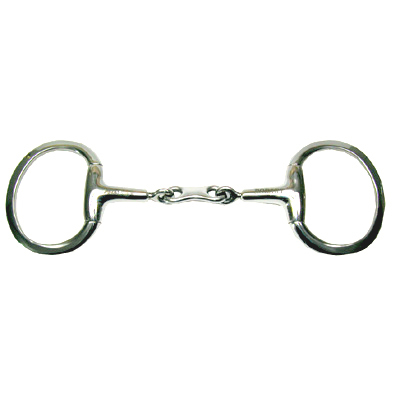 The link in the center allows the bit to drape over the tongue with more contact than a single jointed snaffle. More contact contributes to a more uniform pressure distribution. And, the horse will not get poked in the palate.